I love this show. It’s hilarious and filled with that dry, British wit that I love. It’s impossible to stay in a bad mood while watching this show. In addition to being fully hilarious, each episode is only thirty minutes long, so it’s quite easy to binge on IT Crowd. This show also doesn’t really have a central storyline running throughout like Lost or The Walking Dead, so you can also jump around and watch the show in the order of your favorite episodes rather than chronological. Unlike IT Crowd and Parks and Rec, Bob’s Burgers is still on the air, so every episode isn’t on Netflix (it might be on Hulu, though). Still, with five seasons in the bag, there are plenty of episodes out there for a hearty binge. Bob’s Burgers is an “adult cartoon”, but it isn’t as crass as cartoons like South Park and Family Guy--the characters are also a crapton more likeable. That paired with the occasional song and dance number (not Broadyway style like Family Guy) makes this show great for a light-hearted binge. This is another show that’s currently on the air, but the season on the air now is season 10, so you have nine seasons that you can burn through on Netflix before you even have to start thinking about the current season. Supernatural is a crazy show (and it’s campy at times, I’m not afraid to admit it), but it’s got a lot of heart. You can’t help falling in love with Sam and Dean, and their relationship (which is just as close–though not as destructive–IRL) really carries the show. Whether they are fighting a ghost or trying to seal the gates of hell, Sam and Dean’s relationship keeps the show grounded and heartfelt. And the show can also skew incredibly goofy, so it keeps you on your toes. Okay, this is the most binge-worthy show out there. I burned through all five seasons in just over a month. When I introduced this show to my parents we watched the entire first season with them in a weekend. Breaking Bad was, in my opinion, one of the best if not the best show on television. The writing is brilliant, the characters are dynamic, and the acting is stellar. This show is more addictive than a hit of Heisenberg blue though, and it leaves you with one hell of a Netflix hangover. So watch responsibly, kids–but totally watch, because OMIGOSH it’s such a freaking good show. What are your most binge-worthy shows? Let me know in the comments! 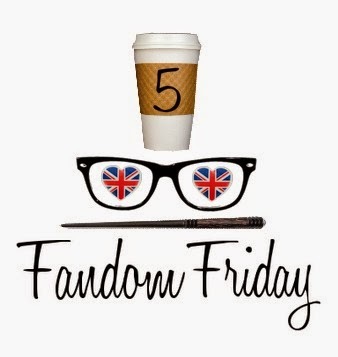 And be sure to check out my other Fandom 5 posts, and follow the #Fandom5 hashtag to see what everyone else is talking about today! Ahahaha, these are all like my “background” (when I’m working on something and want background noise) and binge shows. Love Bob’s Burgers ability to just binge watch in a night. Yes! High five for Supernatural and Parks & Rec! Yeah Supernatural and Parks & Rec! I do get a bit jaded on SPN’s later seasons, but it still a fun watch. Great picks! Supernatural & Breaking Bad made my list this week, too! My husband is a HUGE fan of The IT Crowd – he really relates because he’s in IT 🙂 It’s a really great show! Oh, I’m sure the show is extra hilarious to someone in IT! Great show for sure. So happy to see someone include IT Crowd. Moss is the cutest! Well it certainly is campy, but it’s good camp in my opinion. 🙂 And there aren’t too many vamps in Supernatural so you’re in luck! These are some fantastic picks! I rotate between re-watching The IT Crowd, Parks and Rec, and Bob’s Burgers when I craft. And the most recent season of Bob’s Burgers is on Hulu! They’re all fabulous shows, aren’t they? Out of all of these, Breaking Bad is the only one I’ve seen and it’s one of my most beloved series’. I also have a mad crush on Jesse. He’s definitely the kind of guy I go for. Breaking Bad is so good, isn’t it? So. Good. It definitely set the bar super high for any show I’ve started after finishing BB!